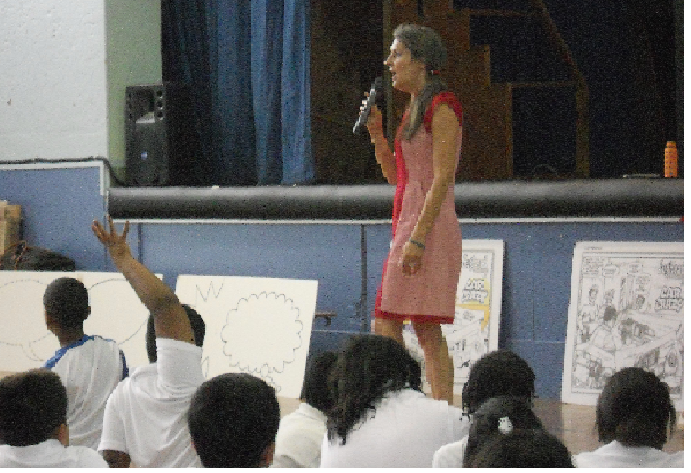 I call my school visits an insight on how Comic books are created. It’s a quiet way to capture students attention. I use the Comic books as a platform to instill career awareness, promote the love of reading, inspire writing, character development, and how one can express one’s passions and messages. Messages can be about any passion – like recycling and refusing of disposible plastics, obesity, bullying. My talks are sparked by my passion for students to embrace reading, knowledge , confidence, creativity. I see the comic book as a powerful tool to stimulate and build today’s children into strong creative thinkers that are prepared to approach complex situations and make good choices. Every child is capable of becoming a Superman or Superwomen and making a powerful contribution to society.